The new museum would be twice as large as the one in Bilbao and will take four years to build. Frank Gehry's proposed design for a new Guggenheim Museum in New York, now given the go ahead by the city, resembles modern sculpture and the impossible dimensions of cyberspace. Its slithering, unfolding mass of glass, concrete and titanium, based on Gehry's highly acclaimed Bilbao Guggenheim in Spain, will sit on the East River, alongside the Financial District. But unlike Bilbao's curvaceous silhouette , the new building's baroque twists are as much sculpture as actual structure. Wrapped within this multitude of what looks like confusion lies a fairly traditional skyscraper, which Gehry has given a wrenching twist. 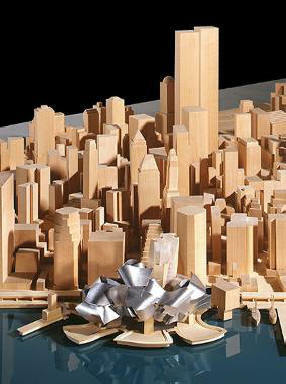 This inner skyscraper reflects Gehry's vision of tying the new Guggenheim to the buildings around it. The tower is slated for luxury condominiums that will be sold or leased at a premium to corporate donors and wealthy patrons. An ice skating rink and a restaurant will sit underneath the structure. However, its implied audience is not the citizen, but the corporate, cosmopolitan elite. Whatever you may think of this, you have to give credit to Gehry, his museum wrapped around a skyscraper is the perfect embodiment of the New World order for art.